This area in Nepean (now part of Ottawa) is bordered loosely by present-day Carling Avenue and Britannia Road. It first began to be developed in 1893 around the same time as The Chateau Von Charles opened in Britannia village, the Old Mill was renovated into a boat club with apartments, and Trilby Lodge began concerts. 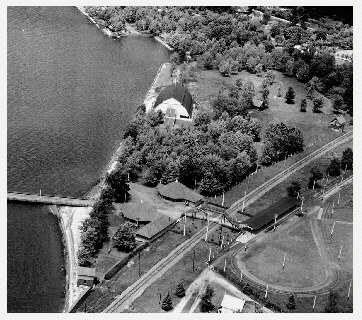 The Ottawa Electric Railway Company which owned Victoria Park was interested to compete with Queen's Park and saw this developing area as a good location. They bought up a right-of-way for double tracks through 13 kilometres of farms to establish a new park on the Ottawa River. Protestors fought against the park and especially the rail line, as they felt the area was already well served by the Canadian Pacific Railway. However, this was for naught and so an auditorium was moved from Victoria Park and presumably other amusements were incorporated. The preview date was April 2, 1900 for the media. Opening day was apparently May 15, 1900 upon which they had their first "Venetian Night" with overnight guests sleeping in verandah hammocks! I assume "Venetian Night" was some sort of themed event. Regular street car service began May 21st. The park continued to grow and eventually became a summer resort with an illuminated pier being built in 1901. The "Albert" supplied ferry service to and from Fitzroy Harbour and The "G.B. Green" also gave moonlight cruises with dancing on Lake Deschenes. Later when this boat was abandoned, and then dismantled in 1945, the bell and ship's wheel were saved. They are on display at the nearby Britannia Yacht Club. A boat club built at the end of this pier became famous as the home base for many winning Canadian rowers and paddlers, one of whom was the Olympic champion, Frank Amoyt. Featured at the club was a trophy-lined dance pavilion. The club house unfortunately burned in 1917 with the "G.B. Green" fighting the fire but to no avail. A new club was eventually built. This newer club is located near the site of an old canal project begun in 1899 by the Metropolitan Electric Company at the base of the Deschenes Rapids. The project was abandoned and the property bought by Ontario Hydro in 1929. It was then later converted into a sheltered harbour for the new club. Telephone service was established to the park in 1903 as a benefit to guests. It terminated in Hudson & Powell's store at the site. The first motion pictures in the area were featured at Britannia. A sheet was placed across the pier entrance to the park and images projected on to it. As well, there was also an open-air live theater to entertain patrons. There is no information yet on the final years of Britannia as an amusement area, but it lasted at least until after World War I and possibly into the 1920s. A 1927 photo, below, shows the pier and other buildings but no amusement rides. This image shows an empty park and its buildings, but no amusement rides. The track running from Center Right to Center Bottom is the Canadian Pacific line. The narrower gauge rail, which loops at Lower Right, was the streetcar track. Notice the white poles following that track. They were to provide power to its electric vehicles. Note too, the pedestrian walkway from the streetcar station going up & over the main rail line to enter the park. At Center Left is the park's pier. 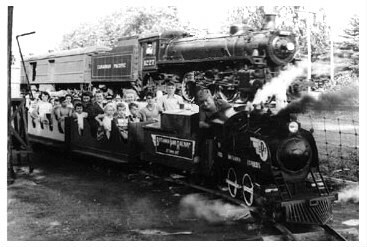 Bernie Geiger of Ottawa volunteers: "During the 1950s and into the 1960s, a small steam train ride entertained visitors to the park. Streetcar service in Ottawa ended in the Spring of 1959 and was replaced with bus service. The old streetcar shelter is still standing. 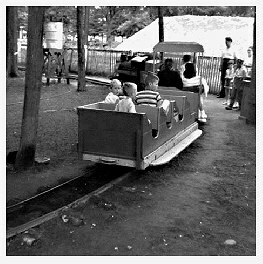 Here, the park's miniature train rounds a curve. In the background sits one of its big Canadian Pacific brothers, CP #1227, built in 1949. Note partly in frame to the far left, the water tower and spout for refilling the small steam locomotive's reservoir. This miniature train may have come from Hanlan's Point. Ottawa train fans Bruce Ballantyne, Bernie Geiger, and David Jeanes have uncovered the possibility that the Hanlan train may have been at Britannia and from there went to Couchiching Beach Park in Ontario. Confusion comes from the possibility that Hanlan's had two different miniature trains and the fact that the Britannia and Couchiching locomotives do not look the same. Research continues. The Britannia train continued to run at least into the 1960s. Bernie Geiger has submitted a later photo of it taken by his father, likely in June of 1962. It is shown below. By then, the train was running counter-clockwise and pulling two cars. (Had it pulled three, previously?) The wire enclosure seen in the first train photo has been replaced with a picket fence. In this later shot, it is obvious the train now runs in the opposite direction. Note the round ties under the track (Lower Left), and the water tower at Upper Left. Britannia Park, its pier and entertainment pavilion continue to operate, but as a city park with no amusements. Today it is a popular beach, with swimming and picnic facilities. Numerous community events take place in a new pavilion which replaced the old building that burned down. Thanks to Bruce Ballantyne and Bernie Geiger of Ottawa for supplying the train photos and information. The air photo is courtesy of Natural Resources Canada from the collection of The National Air Photo Library.